When you have a small bathroom, clutter and disorganization are common issues you face on a daily basis. But there’s nothing to worry about, since there are several smart solutions to keep your bathroom organized. In today’s blog post, we’ve put together some awesome bathroom storage ideas to make the most of your small space. Keep your hair brushes, body scrubbing brushes, loofah, and bathing accessories organized together on stylish hangers with hooks. Find an unused corner of your bathroom near the shower area or near the vanity to mount the hangers. You can either suspend the hangers from hooks or use suction cups to hold them up. For a small bathroom, hanging shower caddies are an excellent storage solution. A classic item, they come with suction cups at the bottom to keep them fixed on the wall. They also have hooks to hold various essentials, such as brushes and sponges, and adjustable baskets to store toiletries and removable soap dishes. A built-in floor-to-ceiling storage tower on one of the walls of your bathroom can provide space for storing several rolled towels, toilet tissue rolls, and other items. This kind of storage tower will also help add texture and visual interest to the tiny space. To keep your small bathroom clutter-free and organized, the trick is to cleverly utilize every inch of space available. Installing bathroom wall cabinets can be a functional and stylish idea to store several bathroom items, including towels, transparent canisters, and toiletries. This is a decorative yet functional storage solution for a small bathroom. Utilize the space under the bathroom sink to keep some of the bathroom essentials organized. You don’t need to opt for closed storage under the sink. This type of storage can come in wall-mounted styles or in standard open shelving style with compact legs. If you choose open shelves under the sink, store your essentials in wicker baskets of various sizes and place them neatly on the shelves to get a chic and organized look. 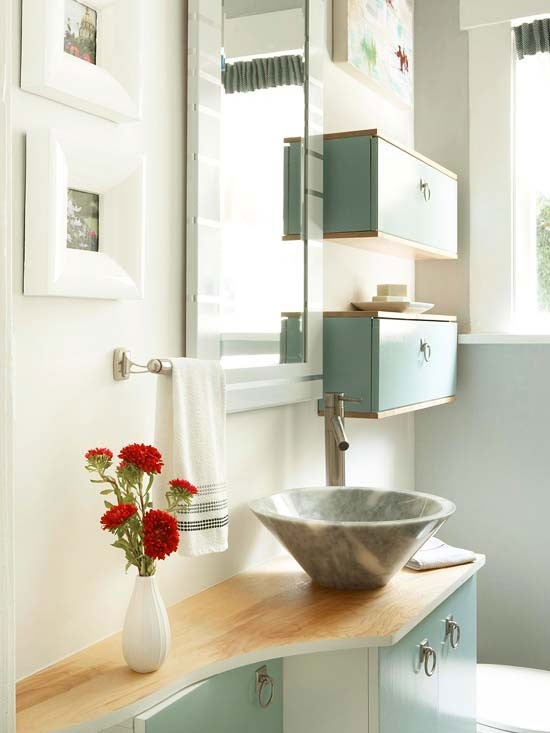 If you have pedestal sinks in your bathroom, you can utilize adjacent places for additional storage. For example, if there’s space between two pedestal sinks, place a floor cabinet with drawers in between. If you have a single sink, you can mount slender shelves with pegs underneath, surrounding the sink area. The inside of your cabinet doors can also be utilized for extra storage. Installing smart storage racks inside them can help safely store electric items such as hair dryers, styling appliances, and personal grooming products so that they’re organized and within easy reach. For an unused corner, pick a free-standing multi-tiered bamboo shelf. It doesn’t take up too much foot space but provides valued storage. Install shower rods in the shower area that can function both as a shower and towel rod. It’ll provide a clean and contemporary look to the bathroom. Now that you have these storage ideas, try some of them in your small bathroom depending on its particular design, availability of space, and your needs. If you’re looking forward to renovating your bathroom, contact Euroline Kitchens. We provide full renovation services in Mississauga and across the GTA. Call us today at (905) 828-1500 for a free consultation.